BioGaia® Junior Probiotic Tablets with Vitamin D help to support the digestive health and maintenance of immune function in adults and children. 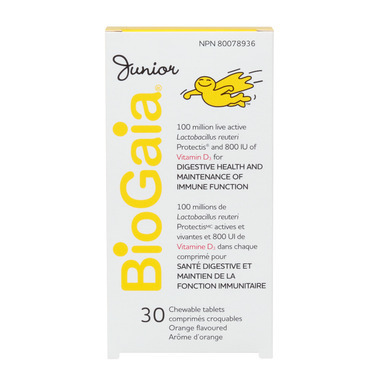 One tablet of BioGaia® Junior Probiotic Tablets with Vitamin D contains 800 IU`s of Vitamin D and 100 million live active Lactobacillus reuteri Protectis. Dosage: Adults and Children (3-17 years): Chew one tablet a day for good digestive and bone health or until your symptoms subside. For diarrhea, take with plenty of fluids. Active Ingredients: 100 million activve Lactobacillus reuteri DSM 17938 (Lactobacillus reuteri Protectis) and 800 IU Vitamin D3. Other Ingredients: Isomalt, xylitol, calcium stearate, palm oil, orange flavouring and citric acid. My toddler had a very hard time pooping, for months and months would struggle. Once she started taking these she could go no problem. She likes the orange taste and chews it up no problem. My toddler was complaining of stomach aches on a regular basis. After a couple weeks on this, she hasn't had any issues! Easily chewable and good flavour makes it easy for her to take as well.